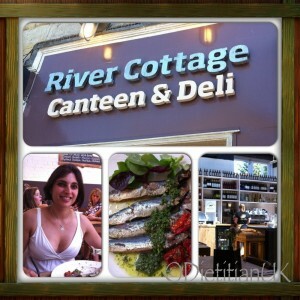 River Cottage Canteen, Axminster, Amazing. This week we had a family business trip, because this is how we roll 😉 The River Cottage Canteen is a place that I’d been yearning to go and eat at for a couple of years, so when I realised we were going to Plymouth…. a little idea was planted in my mind. My geography is ridiculously awful but fortunately I have a husband who indulges my little plans and has a better grasp of geography than I do. So when he told me we could sensibly stop off in Axminster for lunch I was overjoyed. So after a couple of years of waiting there was a fair bit of anticipation in our car…. we were not disappointed. As a wheat intolerant, pregnant lady eating out can be tricky, but not in a place like this. There were a fair few meals I could have chosen and I’m pretty sure they would have made changes to other dishes to make them suitable for me. The place has a relaxed but busy atmosphere but you don’t feel rushed, it’s a lovely set up, an open cooking area, large wooden tables, rustic yet clean and comfortable. I’ve gone off fish bit whilst pregnant but for some reason I chose the mackerel with salsa verde and roasted tomatoes. The salsa verde was divine, so tangy, the tomatoes to die for and the fish just perfect. Hubby had a venison salad – yes a salad! Very unusual for him, but he reported it was melt in the mouth. 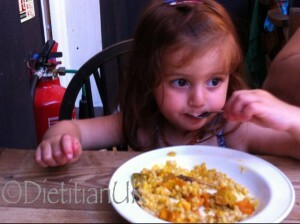 My toddler, now she is a bit of a foodie already. Children’s meals of chicken nugget, chips and beans are not for her, she turns her nose up at them. To be honest I don’t usually order her a meal, she just has a bit of whatever we are having. Not here. There was a proper kids meals menu with choices of hummous and veggie sticks, pollack fishcakes or carrot risotto. She chose the risotto and boy was it a good choice, really creamy, deep and delicious, I was only allowed a little taste as she really enjoyed it! I’d certainly love to go back and eat here again. It was such a treat, a little more pricey than we would normally pay for a lunch out but so worth it for such tasty, good quality food. My only gripe – we got locked in the disabled toilet!! Whoops.